Most people consider Labor Day as the end of summer. We take our last trips to the shore, share picnics with family and friends and say so long to the warmth and freedom of summer. But, Labor Day also means that it’s the last weekend without NFL football, kids going back to school and the leaves will begin to brighten with pretty fall colors. 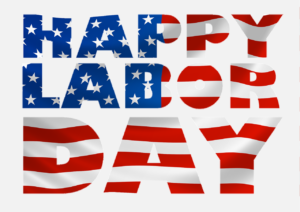 Labor Day is national tribute to the creation of the labor movement and is dedicated to the social and economic achievements of American workers. Due to all of our labor, we have created a society that enables us the conveniences of grocery stores, vehicles to carry our groceries home, machines to complete our chores faster like washing machines and dishwashers, hospitals to care for us, sign makers to promote our businesses, smart phones, teachers to educate us, postmen to deliver our mail and so on. We have a lot of workers to be thankful for today! “There is no substitution for hard work.” — Thomas Alva Edison“All labor that uplifts humanity has dignity and importance and should be undertaken with painstaking excellence.” — Dr. Martin Luther King Jr. Happy Labor Day! May your prosper this year and in the years to come!